I've never had to worry about how fresh our eggs are, since the chickens started keeping us supplied. There's a system of sorts in operation, where the most recent dozen are at one end of a shelf and the oldest are at the other. But as there are rarely more than six dozen eggs on the shelf at a time, even the most elderly are never more than a week old. 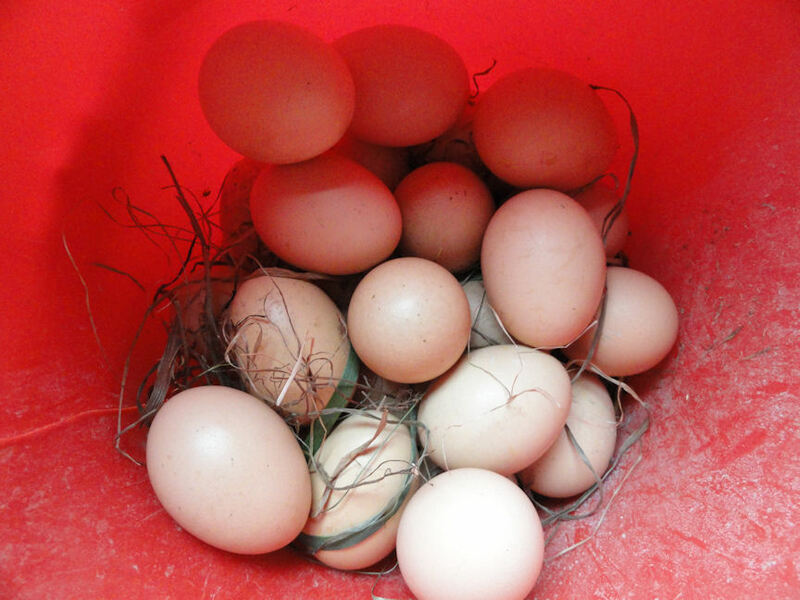 Until this week, that is, when we discovered a stash of two dozen secretly-laid eggs in the orchard. Off to the internet to work out how to determine their freshness. Putting the suspect egg in a bowl of water is the tried-and-tested method. If they sit flat on the bottom, they're fresh, if they don't, they're not. So I diligently baptised each egg. And they all sat firmly on the base of the bowl. I found it hard to believe that they were all scrupulously fresh. I'm guessing, from the colour of the eggs, that there are only one or two hens involved. So that's at least three weeks' worth of eggs. They can't all be fresh! The only way to find out was to actually use the eggs (don't worry, egg customers, if you're reading this - I won't be selling these ones to you!). The difference between a fresh egg and one that's past its best is mainly to do with the structure of the white and yolk. The white loses its plumpness and, if it's very old, the yolk's membrane dissolves and you end up with an unappetising mixture of yolk and white. The trick is to break each egg into a cup first, then decide, from its appearance, whether you want to use it or not. I threw away four of the eight eggs I used at lunchtime today. They didn't smell bad - just looked unappealing, as the yolk had disintegrated into the white. I suppose I could have used them to make scrambled egg, but once you're used to very fresh eggs, you're spoilt. The ones I tested today were the muddier ones of the batch, which probably means they'd been outside longer than the others. I hope the freshness ratio will improve with the remainder. Oh, I relate to this! Just this week I removed a tarp that's been covering two sawhorses since last summer, and found 32 eggs on the ground beneath. Drat. ALL these eggs will be discarded - I couldn't begin to guess how long they've been there. But how I hate the waste! Glad you were able to figure out the age and freshness of yours. Like Quinn, boy can I relate to this one, and like you I occasionally have to resort to cracking the eggs individually into a separate bowl before they go into the recipe. However, two comments - cats and dogs love those eggs and they won't quibble over slightly less then fresh. Eggs are good for their coats. Second, you'll discover that when it comes to hardboiling and peeling eggs, say for egg or potato salad - you want slightly older eggs, otherwise the shells cling to the whites and they are way harder to peel. Sometimes when I know I want a potato salad I have to hoard a few eggs to get them aged enough to use. I wish I'd thought of feeding them to the dog and cat! Will remember that for next time. I agree about hardboiling - you definitely want slightly older eggs for that. I hate it when the white comes away with the shell!